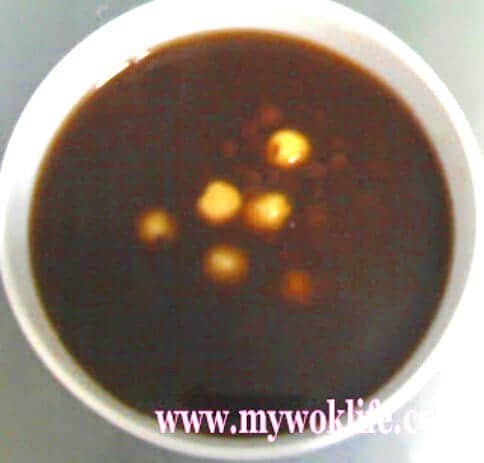 Red bean soup (with round rice balls most of the time) is commmonly cooked and to be eaten during wedding ceremony in Chinese customary. Color of red signifies happiness and fortune, while sweet dessert represents ‘sweet’ and good life. Hence, SWEET RED bean soup will be presented in many occasions such as wedding and birthday celebrations. As for me, I like to take red bean soup regularly, for its high Vitamin B values. Some women believe in taking more red bean soup after their monthly menstruation cycle. I have added with lotus seeds, for its contrast in colour to my red bean soup to make it looked more presentable, at the same, get to eat some of these nice lotus seeds. The soup may be served hot, or chilled. With more liquid base (add more water), or more paste-like consistency (less water and boil for longer hour). It’s all depend on your preference. 1) Place red beans and lotus seed in a pot of water. Bring it to a boil. 2) Add rock sugar. Reduce heat to low fire, simmer for about 40 minutes, or until cooked and tender. 3) If prefer tangy flavour, add in dried orange peel, 15 minutes before heat off. Serve. Calorie count of a regular bowl of red bean soup is about 180 kcal. Good to have it for tea break, I think. Tips:Adding a piece of dried orange peel gives the soup a pleasant tangy flavour. Kinda refreshing taste to your palate. It’s better to get those peels from mandarin oranges. Sun-dry the peels, pack and keep them in the freezer for more lasting effect. Remember, the longer boiling of the peels, the stronger tangy flavour will be yielded. * If you prefer to use dried lotus seeds, please soak the seeds overnight before use. * Soaking of red bean in advance is not necessary. * Garnish with 1 tablespoon of coconut milk, if preferred. I made red bean soup and no one knows how to appreciate it except me hahaha So I had the whole pot to myself. Nevermind, try to cook the white fungus Red Date Dessert, they will sure impressed by you! After making the dish, how long does it last in the refrigerator? Also, can you freeze it? When you serve it cold, do you just take it out of the refrigerator or do you add icecubes? The red bean sweet soup may last for 2 – 3 days, if refrigerated. Hmm… it will become ‘red bean’ ice cube is your freeze it.. :) If you wish, you may blend it with ice, to make ice blended red bean dessert. If you serve cold, refrigerate it for about an hour before serve. Just take out from refrigerator. I do not recommend adding ice cubes as it might dilute the soup and taste bland when ice melted in it. Can I freeze it and later defrost it? I want to make a bigger quantity since it takes so long to cook. When people serve this cold, do they usually add ice cubes or not? You may freeze it and later thaw it to serve, if you are keeping it more than 2 weeks. Or thaw just a little to serve as ice blended red bean or may also use it to make red bean dessert.. Otherwise, just refregerate it may last up to 2 weeks. To serve cold, refrigerate it for about an hour before serve. Just take out from refrigerator. I do not recommend adding ice cubes as it might dilute the soup and taste bland when ice melted in it.